Are you a frustrated filmmaker because you live in the middle of nowhere? Some cities are rich with industry production: LA, NYC, ATL, and a few others. However, we all don’t live there. So what are to do: Move? Sometimes that is just not possible. Quit - NEVER! Instead try this - Organize. You can start an indie film group. That’s what we did, and I am constantly amazed at the results. In 2005, I heard that a person in our community named Christopher Forbes was producing an indie film. It was so rare that anyone in our area ever did anything, so I decided to get involved. Upfront, I was told I wouldn't be paid anything, but that was okay, because doing something is better than doing nothing. Besides, if he had any money, he wouldn't be doing the movie here. His “production office” was the back room of a friend’s bar. Chris told me his camera guy had told him he might not make it to the shoot on Saturday. However, Chris had heard about some other guy in Aiken, SC who had three Canon GL-1s. I told Chris to forget the guy who said, “might” and call the guy with the GL-1s. Two days later I arrived on location. It was a Civil War reenactment. Chris was shooting a film using the production value of the reenactment as a background. Parked ahead of me was the guy with the GL-1’s. I walked up to the little trailer behind his pickup truck. He turned, handed me a GL-1 and said, “Chris wants you to shoot those guys over there”, and that’s how I met Rick Kelly. As it turned out, somebody else I knew who was working in corporate production showed up with his Canon XL-1. Across the field was a sound guy, Dan Keaton. The bar owner, Brad Owens, showed up, wearing a Civil War uniform. It turned out to be a pretty good day. So the production continued for a few months, mainly shooting on weekends. Admittedly the film was not in Oscar contention, but it didn't matter. What did matter was that we were all making a movie, “The Battle of Aiken”. With the mission statement in place we were able to focus on the craft of filmmaking, not on a product. We started to attract new members. We decided have our meetings once a month, on the third Tuesday at 7 PM. Occasionally, there would only be three people at the meeting. But it didn't matter. Then we were having 10 people show up regularly, then 15. Soon people from 70 miles away in Columbia, South Carolina started to attending our meetings. People in Charleston, SC were getting into contact with me. I introduced two people in Charleston that wished they could attend our meetings; they lived a mile from each other. 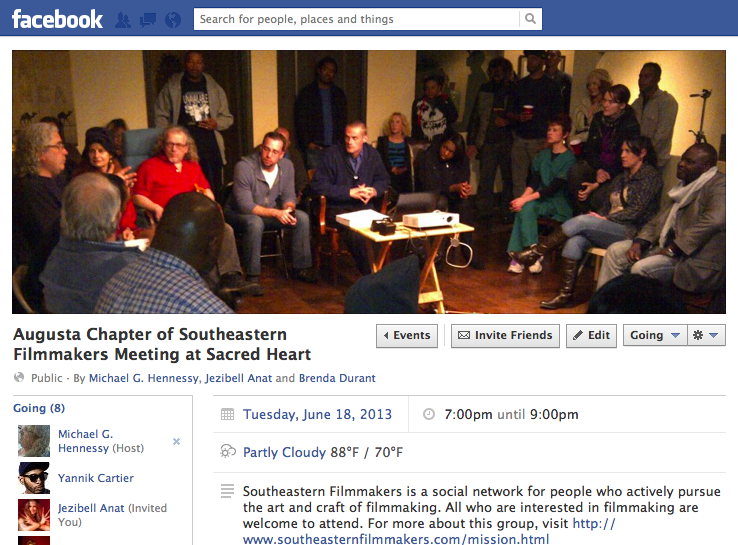 Our group established Chapters in Columbia and Charleston, and AugustaFilm became Southeastern Filmmakers, www.southeasternfilmmakers.com . We now have over 300 members. In the decade that followed, good things have happened to the people in our group. Rick Kelly expanded his equipment into www.Indiegrip.com , the area’s only grip and lighting rental house. Rick has lit 3 Presidents and Oprah. Dan Keaton left his computer support job at the local newspaper and now works for Convergent Design, www.convergent-design.com , as their international and national sales director. Brad Owens and the City government are now in the process of trying to attract industry level productions to our area. Chris Forbes has had several low-budget films picked up for distribution. It amazes me when a distributor sends in a Hollywood “name” actor to Augusta, and I get to light them. I’ve worked on so many low budget film productions and entered numerous contests, I’ve gotten lots of practice. This makes me a better teacher. Best Regards, and remember the first three rules of production: safety, safety, safety. "I wish they taught film when I was in high school." You might be like a lot of indie filmmakers, wishing you could of studied film in your middle and high school years. Fortunately, you have not given up on your dreams and desires. You are a filmmaker. So what if you have not yet won an Academy Award? That is not the standard by which we are judged. However, we owe it to ourselves, our family, friends, and groupie(s), that the short film or video on our drawing board will be better than the one we just made. That's why I'm here. I am a professional teacher. I teach Broadcasting & Film to middle and high school students. I am the teacher your high school needed. I am the teacher my old high school needed. Who am I? In many ways, I'm just like you: working a day job, have a family, dream, write, think, read, study, produce, shoot, cut, critique, and repeat. I do it all, except quit. Today, let me share with you one thing - if you quit, you will never win. Best Regards and remember the first three rules of any shoot: safety, safety, safety.